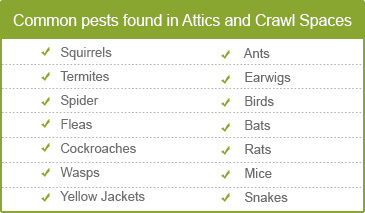 The presence of pests, termites or other critters in your attic or crawl space can pose a big problem. Their presence, if left unattended, can lead to the spread of dangerous diseases, the loss of personal belongings and to excessive spending on repairs. Monitoring, maintaining and upgrading the attic and crawl space thus reinforces structural security and also ensures the health of your loved ones. We, at Quartz Solution, specialize in all that is required to keep your attic and crawl spaces safe, hygienic and comfortable for years to come. Pest and termite infestations remain hidden for years. Unfortunately, their presence becomes visible when the have eaten into your priced possessions. Presence of fleas, wasp, and ants is a potential health hazard. Cockroaches leave a residual trail of bacteria, which could cause health problems. Mice and rats damage house cables and insulation ducts; impairing the insulation system of the house. Mold and mildew thrive on excessive moisture. These cause extensive damage to wood and basic structure. The cost of restoring these damages can add up quickly. Microorganisms undoubtedly grow faster in attic spaces. Damp, leaking and cracked ducts provide them with the perfect breeding grounds. A careful assessment, that too by a professional, will help unfold the existing as well as impending dangers and threats. 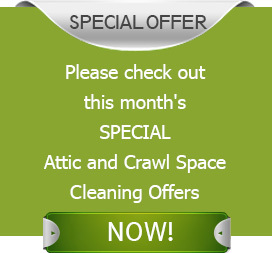 Our team of professionals is apt at handling all attic related problems. Preliminary inspections are free, and will be carried out at a time most suitable to you. You can expect only the best in terms of services from Quartz Solutions. Needless to say, these services are most reasonable and competitively priced with no hidden charges. Bergen County, New Jersey is our home, and its also home to many other residents. At Quartz Solutions, we wish to maintain the serenity and peace of mind; thus, our sincere efforts to help you in keeping your attic and crawl spaces safe, healthy and hygienic. Simply call 201-205-2042 to get a free inspection by Quartz Solutions!